ALABASTER Twp. – Iosco Coats for Kids received a $5,000 donation from the USG Foundation, with a check presentation taking place at the USG Alabaster Township plant on Nov. 27. According to those from the company, June Pursey’s holiday shopping involves some very large orders, with her Black Friday purchases totaling more than $7,000 this year. Pursey, along with her husband Tony, runs the Iosco Coats for Kids program and she said there is a huge need throughout the county for the services provided by the organization. Early winter is the group’s busiest time of year, and USG representatives say donations have been pouring in this season and stacking up outside of the Coats for Kids office on Bay Road in Tawas City. The sorting and distribution of coats for students in the local school districts is now complete, but the 35th annual FISH, Inc. Christmas Gifthouse is just around the corner. Coats for Kids gives out about 350-400 coats to local, low income families during the Gifthouse event, which is held each December at the Tawas United Methodist Church in Tawas City. According to Pursey, Iosco Coats for Kids supplies an average of 1,400 coats to area families each year. The organization also provides boots, gloves, hats, scarves, socks, long underwear and snow pants. “If we have it, they get it. If we don’t have it, we’ll try to find it or go buy it,” Pursey said. That spirit, along with the outstanding work Coats for Kids does in the area, made them a perfect candidate for the USG Foundation’s annual community grant, according to those from the company. 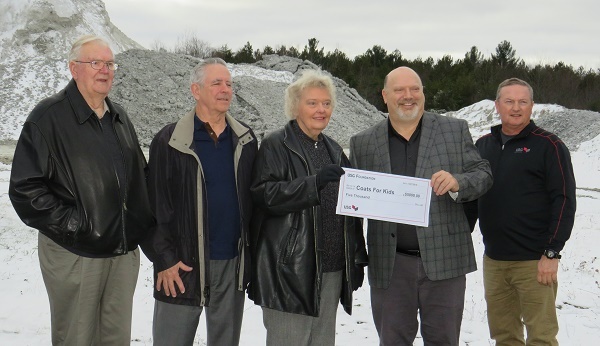 USG Alabaster Plant Manager Matt Craig, along with Operations Manager Jim Sheehan, presented the $5,000 check to support the Coats for Kids efforts in Iosco County. June and Tony Pursey were joined by fellow volunteer/board member Al Webster to accept the gift. “What this organization does for the community is so needed; so important to families. We’re proud to support their continued great work,” Craig remarked. Company representatives advise that the USG Foundation supports a wide range of organizations which promote social, health and educational services across North America. This includes offering an annual $5,000 grant to each community in which USG operates. Recipients are chosen by an internal committee of USG employees who are familiar with the local community. The 2017 beneficiary was the Iosco County Historical Museum. Iosco Coats for Kids was started in 1995 by an area minister and a handful of local social workers. The Purseys got involved 13 years ago, and June said the need throughout the area has increased steadily. “One of the area schools was just here this morning, looking for boots,” she shared on Nov. 29. “The support from USG will mean we can buy some things we don’t have donated, as well as some things we don’t normally have around, like socks and long underwear. This is funding we can mobilize immediately to help the people we serve,” Pursey noted. To learn more about Iosco Coats for Kids, or to make a donation, contact Pursey by phone at 362-8161 or via e-mail at twopurseys@mich.com. The USG Foundation, starting in January, will begin accepting 2019 applications for the annual grants. To learn more about the foundation, contact Craig at 313-624-4230 or by e-mail at MCraig@USG.com.